Founded 56 years ago, the Jamaican Canadian Association (JCA) was created by Jamaicans living in Toronto. It was 1962, and as Jamaica prepared for independence from the United Kingdom, this group decided to plan a celebratory dinner and dance. The event on August 6, Independence Day, was a roaring success. Discussions afterwards supported setting up an organization that could both help immigrants from Caribbean countries adapt to life in Toronto and advocate on behalf of Caribbean and African-Canadian citizens in the city. To this end, a Constitution Committee, made up of three men and three women, was established. On September 23, 1962, participants at a well-attended Organizational Meeting approved the JCA constitution and elected its first Executive Committee. Dr. Vincent Conville, a long-time member of the association and its president from 1977 to 1978, wrote his PhD thesis on the JCA. In 2008, he donated the material that comprises the Jamaican Canadian Association fonds to Library and Archives Canada. This material contains transcripts of oral interviews he conducted with founding and prominent members of the group as well as copies of the JCA newsletter, In Focus. 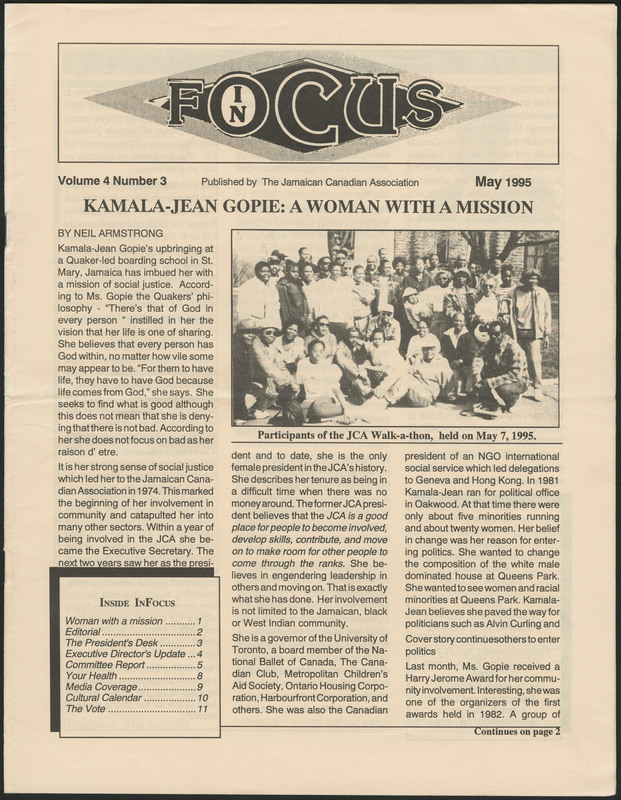 These interviews and newsletters include many frank and insightful opinions from women such as Amy Nelson, Kamala-Jean Gopie and Erma Collins. Unusual for its time, the JCA had more female than male members. These women were a diverse group of university students, nurses and domestic workers who joined the association with a shared desire to help others in the Caribbean community in Toronto and across Canada. Women in the JCA played a varied role that changed over time. Despite their numbers, women acted largely behind the scenes rather than in leadership positions during the JCA’s first decades. They organized fundraisers, created committees and supported the association’s goal of providing much-needed social services. In an interview conducted by Dr. Conville, one of the founding members of the JCA, Amy Nelson, acknowledged the inequality in the organization, viewing it as a product of the times: men were simply found in leadership roles more often, whether in the JCA or in society at large. One woman who managed to become a leader in the JCA was Kamala-Jean Gopie (formerly Jean Gammage). Joining the association in 1974, she quickly became a very active member. In 1975, she took on the role of Executive Secretary, and from 1978 to 1980 she served as the first female president of the JCA. Despite her leadership roles, however, she recalled in an In Focus interview that attending an award ceremony as a guest rather than as an organizer was a novel experience! The unique contributions by women in the JCA led to the creation of what was initially the Women’s Auxiliary, later resurrected as the Women’s Committee. Formed in the early 1970s, the Auxiliary focused on using women’s backgrounds as health care workers to support some of the JCA’s activities. In its second incarnation as the Women’s Committee, the focus changed. Erma Collins, the first female Vice-President of the association, and Pam Powell, a former Board member, recalled that this committee filled gaps in programming for the female membership. The committee addressed pressing issues such as women’s health care, including organizing a health fair in Ontario for Black women, in 1993. The committee subsequently broadened its focus to address other issues of gender equality as well. The Women’s Committee proudly continues to this day! Christine Barrass is a senior archivist in the Social Life and Culture Private Archives Division of the Archives Branch at Library and Archives Canada. Happy 50th Anniversary to the Jamaican Canadian Association! On August 6, 1962, Jamaica gained its independence from Great Britain. The Jamaican community in Toronto organized a banquet and party for that date to celebrate the historic occasion. 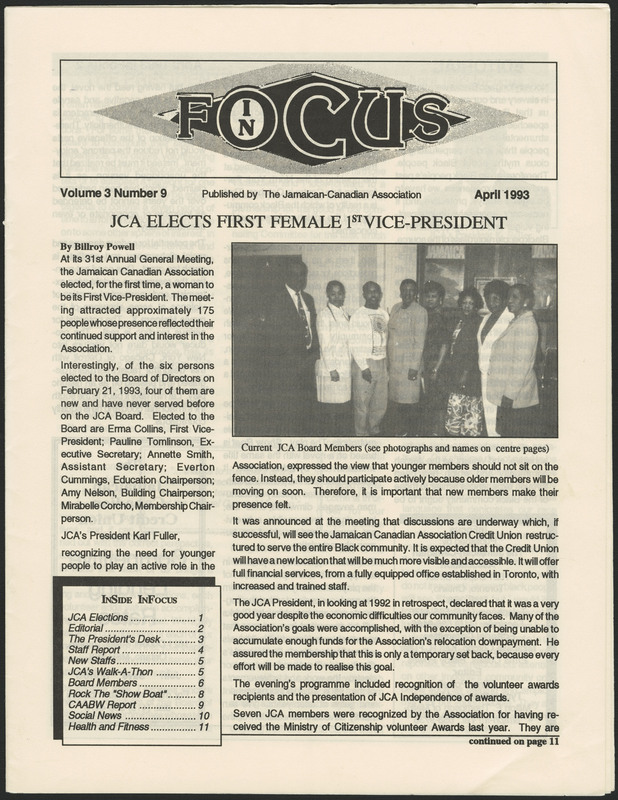 In the following weeks, the Jamaican Canadian Association (JCA) was born, holding its inaugural meeting on September 23, 1962. Over the past 50 years, the JCA has provided a variety of social, cultural and community services to Jamaicans in the Toronto area. Library and Archives Canada (LAC) is proud to hold the historical records of the Jamaican Canadian Association, which document its history and development. LAC also holds the records of Jamaican-Canadian and civil rights advocate, Stanley Grizzle *, who began his career as a Sleeping Car Porter with the Canadian Pacific Railway, and retired as a Canadian citizenship judge. You can explore these two fonds in LAC’s online Archives Search database to find out more about the history of Jamaicans in Canada. Although the contents of the fonds are not digitized, the Archives Search database will provide you with a general overview of what they contain. (*) Access to the Stanley G. Grizzle fonds is restricted. Therefore, researchers must first agree to sign the Application for Access form before they can consult the records. By signing this form the researcher agrees to respect the Canadian Copyright Act and the right to privacy of living persons. For information about the possibility of gaining access to these records, ask us a question. Please remember that not all of our material is available online; however, it is possible to order archival material through our online Request for Retrieval of Documents Form. Archival material can be consulted on site at 395 Wellington Street, Ottawa.